Our third issue, Volume 2, Issue 1 (2018), has now been published! Click "Current" in the Menu Bar to view our new issue. Cover image created and provided by Kori Czuy, a participant in the 2017 International Doctoral Seminar. 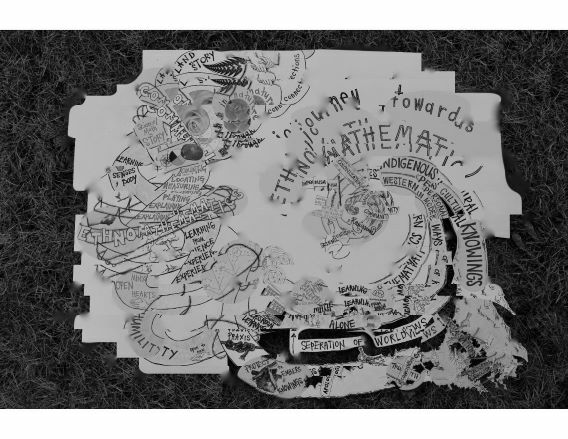 A hand-drawn, woven "academic poster", has been digitally altered to symbolize the effects of modern technology on multiple ways of knowing. Depicted are Indigenous cultural, personal, and western modern ways of knowing mathematics as the three strands of a sweetgrass braid, and their journey towards ethno(mathematics). Each strand of the braid interacted together and complemented each other before scientism, but colonization tore the strands apart, and segregated Indigenous ways of knowing while supporting and promoting Western Eurocentric ways of knowing mathematics. Ethno(mathematics) reweaves the strands together, (re)membering the connections mathematics has with body, senses, land, community, and spirit. The sweetgrass braid represents community, many strands/people/worldviews working together while retaining integrity (Eagle Speaker, p.c.) (Czuy & Hogarth, 2019, p.8). The grass behind the poster is dead from the winter, but is on the verge of a spring (re)growth, symbolizing Indigenous ways of knowing being on the verge of a (re)newal.